Starting in the mid-nineteen eighties, private corporations began owning and operating fully privatized prison facilities; these privatized prisons operate similar to hotels, in that they are contracted by the state to house/care for prisoners and are paid by the prisoner. Unlike public prisons, which may contract out food, maintenance or medical services to private companies, private prisons are wholly run by large corporations under the profit motive. A vast majority of private prisons in the USA are under the ownership of two major companies: CCA (Corrections Corporation of America) and the GEO Group. As of this year, these two corporations are operating over 250 prisons, which house over 100,000 prisoners, for revenue of nearly $3 billion. When analyzing private prisons in the USA, there are several main concerns: The cost to the taxpayers, the perverse incentive problem, and the civil rights of those imprisoned. Unlike normal prisons, private prisons are run for a profit, thus the money taken as profit by the corporation is by it definition, administrative waste. The recent spreading of private prisons throughout the southern USA has little to do with their efficiency, but it might have something to do with the fact that they spend several million dollars per year in lobbying and campaign contribution to politicians (Reported by the Justice Policy Institute). The perverse incentive problem that plagues the private prison industry is simple: Private prisons make money by imprisoning people and cutting costs, thus they make more money by ensuring that more people are imprisoned and by reducing the quality of living conditions inside of the prison. As corporations will always increase profit when given a chance, there is a perverse incentive that pushes these companies to lobby for measures that are designed to imprison more people, regardless of the ideals of the justice system. The private prison lobby, as well as associated groups such as ALEC, have advocated for increased immigration laws, harsher sentencing requirements, three-strikes laws, and the continuation of the war on drugs. Harsher immigration and drug laws benefit private prisons because they drastically increase the number of non-violent offenders sent to jail. The Arizona SB1070 “Papers Please” law is the most visible example of how these criminalization laws work; by criminalizing illegal immigration, all detained under this law are sent to private prisons rather than released, thus these prisons have more prisoners. Non-violent offenders are easier to imprison than violent offenders because they are lower risk, thus private prisons can make a high profit off of these people. By lobbying states to increase the spread of three-strike laws, mandatory minimum sentencing, and the harshness of sentencing, prisoners are sent to jail for longer periods of time. As private prisons rely upon occupancy to make a profit, longer prison stays equal more sustainable profits for the private prisons. In addition to the legal methods by which private prisons increase profits, there have been cases where they have resorted to highly unethical and illegal methods. The recent scandal in Pennsylvania, where juvenile court judges were bribed by private prisons in order to sentence children to private prison facilities, is the perfect example of how the perverse incentive distorts the justice system. Several judges were paid by the local private prison to sentence innocent or first time offending minors to substantial prison sentences; the fact that these judges were paid by the head has led to the case being called the “kids for cash” scandal. While the judges in this case were found out, disbarred, and charged, the private prison is still operating to this day. When profit overshadows law in the justice system, our entire system of law is called into question. Like any business, private prisons seek to cut costs and maximize revenue in order to increase profit to the shareholders. For private prisons, cost cutting measures include employing non-union guards, reducing the quality of services available to prisoners, and decreasing the quality of goods used in the operation of the prison. Non-union guards are paid less than unionized guards, thus private prisons can reduce the cost of staffing their prisons at the expense of the quality of their workforce. Private prisons often buy the least expensive goods and services available in the keeping of their prisoners in order to turn the maximum profit. As prisoners are literally a captive marketplace, they cannot go out and get superior goods if those given to them are inferior; due to this, private prisons supply only the bare minimum under the law so as to reduce their expenses. Educational and treatment programs in private prisons are virtually nonexistent due to their higher costs. As private prisons are run for a profit, they don’t care about the guilt, rehabilitation or comfort of their population, thus they do only the minimum required to fulfill their contract with the state. In addition to cutting costs, private prisons often charge inmates for additional services and run prison labor programs in order to increase their profits. Phone calls are an example of a service that private prisons have been known to sell to their population at exorbitant rates for a profit; an example of this situation is present in a Georgia CCA prison, where they currently charge inmates $5 a minute for phone calls (including those to the inmates’ legal counsel). By massively overcharging for goods such as phone calls, private prisons are able to increase profits far beyond that of their basic contract with the state, thus even further increasing the total cost of such prisons to society as a whole. Most private prisons use inmate labor in order to make additional profits. Private prisons contract with other corporations, or even the state, to supply extremely cheap (less than $10 a week in some cases) physical labor; farming/landscaping, customer service, and unskilled construction of goods are three areas of industry where private prisons have supplied significant prison labor to. By paying prisoners a fraction of the minimum wage, private prisons are able to undercut all other labor contractors and ensure increased profits. The civil rights of prisoners in private prisons are not as strongly protected as those of prisoners in publically run prisons. In the recent case of Minneci v Pollard, the Supreme Court decided that prisoners of private prisons are not able to sue the corporation which owns a prison if that prison infringes upon their rights; these prisoners can sue the individual guards of the prison, but neither the state nor the prison corporation are not liable for damages. When combined with the perverse incentive to imprison more people and to cut costs, the decrease in liability to the private prisons creates a situation where huge profits are garnered through imprisoning a significant portion of the US population. These corporations lobby politicians through donations in order to change the laws to imprison more people, regardless of the social impact. Illegal immigrants, the poor and minorities are often the most affected by the policies enacted to increase private prison profits. Once people are imprisoned, they have little recourse when their rights are infringed upon. 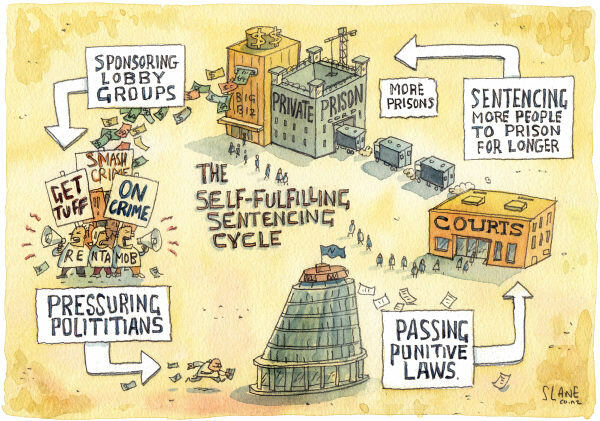 The vicious cycle of imprisonment and profit targets those who have the smallest voices in society, for the benefit of those who own the correction corporations and people stand silent because these people are “only criminals” and “deserve it”; most don’t realize that for as long as people profit from imprisoning others and politicians are willing to sell their vote, this cycle will continue and may one day entrap even those who try their hardest to obey the law.